Many parents worry about what their child is using the computer for and want their limited computer time to be beneficial rather than wasted aimlessly searching the internet, ‘chatting’ with friends or playing games. 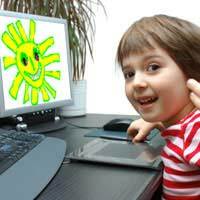 Encourage your child to make the most of their time on the computer by exploring ways to be creative. Think of it as a digital version of creative play – the modern day equivalent of finger painting, writing a journal or playing with a toy drum kit. The great thing about creating digital artwork is that it can be endlessly reproduced. Get your child to start thinking creatively and design Christmas, birthday and Good Luck cards to send to family and friends. For best results set them subject guidelines – maybe you want a flower or animal based picture for birthday cards? A tree or Santa for Christmas? Within these guidelines encourage them to use a photo they’ve taken, draw a picture using basic creative software, or scan something they have made at school. Depending on the age of the child you can teach them (and this might involve you learning together) how to set their image up on the page so that it will print correctly, and they can learn simple image manipulation skills. We’ve all heard stories about pop stars who created their debut albums using simple music software in their bedrooms and shot to fame on the back of it. If your child (particularly if they are in their teens) is into music consider investing in some music production software and some basic recording equipment. You don’t need to spend a fortune and you’ll find that they put all the energy previously reserved for playing games into creating music. Encouraging creativity is really positive in your child’s development but if you have a budding musician on your hands buy them a good pair of headphones so you don’t have to listen to their fledgling efforts as a music producer. You don’t need a computer to write a short story or a journal but there are loads of child friendly websites that will encourage your child to harness their creative energies and give them writing ideas when they’re flagging. Most of them are more female focussed and centre on the idea of keeping a private (and password protected) journal online which they can invite friends to share. Creativity strikes us in different ways and some kids might not seem to be at all ‘creative’. Even the most prosaic child might find a creative outlet in learning simple programming though and will then be able to create basic games and graphics. The most important thing to remember is that this is their creative project and your input should only be to guide them through the technical side of it. Try to avoid ‘helping’ them too much and if you really can’t resist maybe you should start your own creative project!